Resorts World Catskills Casino Resort opened on February 08, 2018. With a ceremonial roll of the dice, following the ribbon-cutting, the public experienced Las Vegas-style gaming with more than 150 live table games and 2150 state-of-the-art slot machines! Only 90 miles from Manhattan, the Resorts World Catskills resort casino features gaming options, luxury amenities and accommodations, all a part of the a $1.2 billion project that includes the casino resort, a planned entertainment village, an indoor water park lodge, and an 18-hole Rees Jones designed golf course. Resorts World Catskills is opened to the public 24 hours a day, seven days a week, and 365 days a year. The casino resort’s call center is reachable at 1-833-586-9358. A Grand Opening celebration is scheduled for May 2018. More information on events, and additional opportunities to experience Resorts World Catskills, will be released in the coming weeks. “Our staff has worked tirelessly to ensure that when we opened our doors for the first time, we were ready to provide our guests an unparalleled experience,” said Ryan Eller, President and Chief Executive Officer of Resorts World Catskills. Charles Degliomini, Executive Vice President of Resorts World Catskills said that they looked forward to driving tourism to the Catskills, stimulating the economy and making meaningful contributions that help put the Catskills back on the map as a premier getaway and true destination. 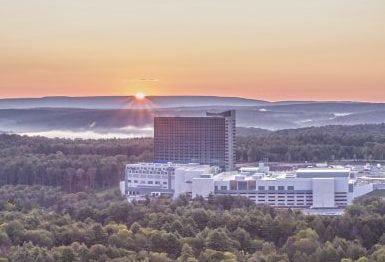 The Resorts World Catskills casino resort is expected to provide more than 1,400 jobs in the region, upstate New York. The Resorts World Catskills casino resort includes an 18-story hotel, casino and entertainment complex with approximately 100,000 square feet of casino floor, featuring over 150 live table games, 2,150 state of the art slot machines, a poker room and private gaming salons. Guest amenities include 332 all-suite luxury rooms, which include 12 penthouse suites, 8 garden suites and 7 two-story villas, two indoor pools, a spa and fitness center — all designed to meet 5-star and 5-diamond standards. Guests can choose from over 10 varied bar and restaurant experiences, including fine dining, and an Italian steakhouse created by celebrity chef Scott Conant. Guests can enjoy year-round live entertainment at the over 2,500-seat event center, casino bars, restaurants and lounges. The destination resort in which Resorts World Catskills is located will also include an entertainment village providing additional entertainment, food and accommodations and a Rees Jones-redesigned golf course, both of which are being developed by subsidiaries of Empire. In addition, the destination resort will include an indoor waterpark lodge. Visit www.rwcatskills.com for more information. Photo credit: Sullivan Catskills Visitors Association.